Please note that the content of this book primarily consists of articles available from Wikipedia or other free sources online. 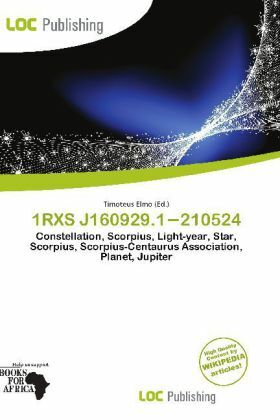 1RXS J160929.1-210524 is a pre main sequence star nearly 470 light-years away in the constellation of Scorpius. The star was identified as a 5 million year-old member of the Upper Scorpius subgroup of the Scorpius-Centaurus Association by Thomas Preibisch and coauthors in 1998. On 8 September 2008, it was announced that astronomer David Lafrenière and collaborators used the Gemini Observatory to take pictures of the star which appeared to show a planet.